One of women’s hockey’s most exciting young stars has made her way onto the scene of NCAA Hockey East. Now 20 years old and a freshman at Northeastern University, Switzerland’s Alina Müller holds the Olympic record for youngest medalist in women’s hockey. At all of 15 years old at the 2014 Sochi Winter Games, Müller scored a goal and two assists as the Swiss skated home with the bronze medal. Though they would not medal at the recent 2018 PyeongChang Games, Müller still managed to turn that tournament on its ear by being the leading scorer of all women’s hockey participants at those Olympics. In fact, she was the only female hockey player to score double digits in points in South Korea and one of just two hockey players total to accomplish the feat (on the men’s side, the Olympic Athletes from Russia’s Nikita Gusev did so as well). 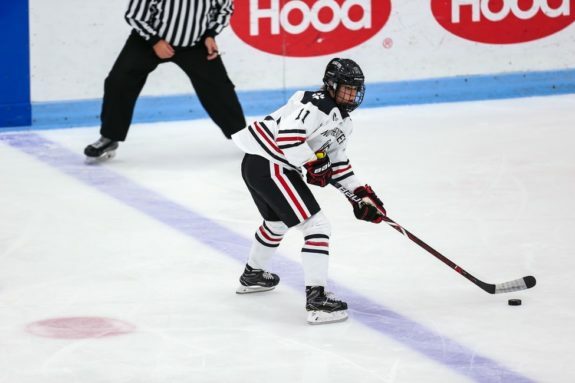 Now the Northeastern Huskies believe that she will continue to be a scoring-machine with a winning spirit on the college hockey scene too. They are welcoming her on board with widely opened arms. Northeastern has routinely found success with European players in their women’s program. Players such as Denisa Křížová (Czech Republic), Lucie Povová (Czech Republic), Müller’s fellow countrywomen Florence Schelling and Julia Marty, and fellow freshman Chloé Aurard (France) have each found success as Huskies. Now it’s Müller’s turn to showcase her talents. Undoubtedly there would be many NCAA women’s hockey programs who would salivate over the opportunity to have Müller on their roster. Scouting European talent for college teams has become normal practice now among NCAA schools of all levels, but particularly at Division I. For example, the 2018-19 Maine Black Bears women’s roster has three Czechs, three Swedes, one Latvian, one Russian, and one Danish player. To Northeastern’s credit, they have both Müller and Aurard as their Europeans. The fact that two teammates of Müller’s on the Swiss Women’s National Team are Northeastern alums helped narrow the decision down to the Huskies being the right fit for her. Alina Müller is all smiles about playing for the Northeastern University Huskies (Photo Credit: Jim Pierce/Northeastern Athletics). Müller’s brother Mirco is an NHL defenseman for the New Jersey Devils. Contrary to his sister’s approach, her older brother opted to play Canadian Junior Hockey in the Western Hockey League (WHL) for the Everett Silvertips, before ultimately being drafted into the NHL. For women’s hockey players, often the best option to play at the highest level before going professional is NCAA college hockey. The Hockey East Association is arguably the finest branch of women’s college hockey. 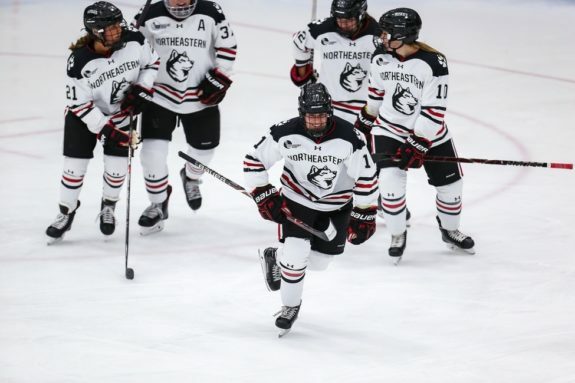 In addition to Northeastern, the other women’s teams comprising Hockey East include Boston College, Boston University, University of Connecticut, University of Maine, Merrimack College, University of New Hampshire, Providence College, Holy Cross, and the University of Vermont. In Müller’s six games during the PyeongChang Olympics she scored a whopping seven goals and three assists. Not only did she lead all women’s players from all nations in scoring, but she was also the recipient of the tournament’s Best Forward Award for her performance. Though the Swiss would be eliminated by the Olympic Athletes from Russia in the quarterfinals, they would end up finishing fifth overall with five wins and the single loss. Müller’s individual performance will long be remembered for how deadly of scorer she was all tournament long. Six of her 10 points came during Switzerland’s opening game in the preliminary round against Team Korea (unified between both North and South Korea). In the 8-0 Swiss victory, Müller lit up goaltender Sojung Shin for four straight goals – three in the opening period alone – and picked up a pair of assists in the third period. Granted, the Swiss were the heavily favored team, but no matter the final score that was still a phenomenal solo performance in one game for any player. Müller would go on to tally goals against Japan and Sweden in the prelims, as well as in the 6-2 quarterfinal loss to the Olympic Athletes from Russia. Alina Müller together with her Northeastern University teammates (Photo Credit: Jim Pierce/Northeastern Athletics). Müller feels that her Olympic experience has better prepared her for her college career at Northeastern, particular when it comes to the endurance and dexterity of her body. She also recognizes that such experiences have made her a more well-rounded athlete and person. 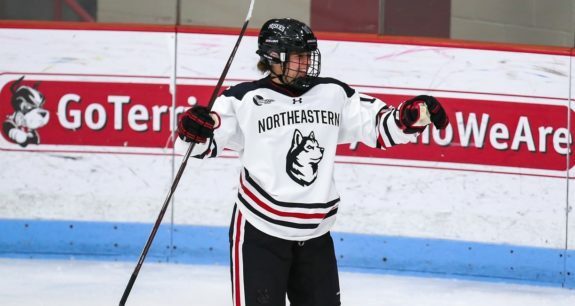 The best is yet to come for both Müller and the Northeastern Huskies. The first day of fall classes began for Northeastern underclassmen on Sept. 5, 2018. While there is understandably a period of adjusting and getting acquainted with college life as far as being a student goes, Müller is the kind of player who can make a difference for her hockey team right from the get-go. She moves the puck incredibly well, and much of that is generated by her vision, hockey sense and her skating ability. Müller is always dangerous anytime that she is on the ice – you have to watch out for her, or a price often has to be paid if you don’t. Alina Müller carries the puck up ice for the Northeastern Huskies (Photo Credit: Jim Pierce/Northeastern Athletics). Never giving up and putting the team first are intangibles that the Huskies women’s hockey team have been built upon for years. That type of mindset among their players has brought about success for the school and for the individual players themselves. Former Huskies Křížová, Kendall Coyne Schofield, Hayley Scamurra, Colleen Murphy, Paige Savage, Lauren Kelly and others have all go onto professional careers in the NWHL. Northeastern breeds success for its players, and it seems to last a lifetime. As for the academic side of things, Müller has not made a final decision on her major but does have some interests that she is considering. Each an admirable consideration on her behalf. Aside from hockey and studies, before we parted with Müller we asked her for a “fun fact” about herself that most people would not necessarily know about her. “I eat dessert every day,” she stated rather proudly. Northeastern fans, you will be delighted by Müller for a full four years. The highlight-reel goals we became accustomed to in PyeongChang are certain to follow her to Boston, Massachusetts. Sit back and enjoy!